ON COURSE: STRATEGIES FOR CREATING SUCCESS IN COLLEGE AND IN LIFE, International Edition presents a hands-on approach to learning essential life and study skills. 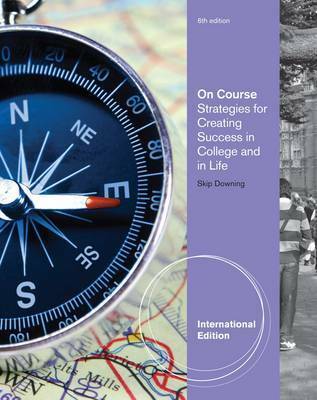 Now in its 6th edition, ON COURSE is used as a text in student success courses, first-year experience programs, and inward-looking courses that promote student growth and self-awareness. ON COURSE demonstrates the choices that successful students make. A self-assessment tool at the beginning of the text helps students to identify behaviors and beliefs they may wish to change in order to achieve more of their potential in college and in life. Students have an opportunity to revisit their self-assessment at the conclusion of the text. Written in a positive, motivational style, ON COURSE empowers students with the tools they need to take charge of their success in college and in life. Downing's distinctive guided journal entries help students develop essential life skills by encouraging exploration of personal responsibility, self-motivation, interdependence, and self-esteem. Extensive coverage of study skills - reading, note taking, memory and test taking - provided in the Wise Choices in College sections helps students excel in all of their college courses. Students are encouraged by hearing from their peers through a unique feature called One Student's Story, which highlights the implementation of the text's strategies. 1. GETTING ON COURSE TO YOUR SUCCESS. Taking the First Step. What Is Success? The Power of Choice. Write a Great Life. Assess Yourself. Self-Assessment Forks in the Road. A Few Words of Encouragement. Journal Entry 1. ONE STUDENT'S STORY: Jalana Onaga (University of Hawaii, HI). Becoming an Active Learner. How the Human Brain Learns. Three Principles of Deep and Lasting Learning. Your CORE Learning System. Journal Entry 2. On Course Principles at Work. Believing in Yourself: Develop Self-Acceptance Self-Esteem and Core Beliefs. Know and Accept Yourself. Journal Entry 3. ONE STUDENT'S STORY: Phyllis Honore (Cuyahoga Community College, OH). Wise Choices in College: College Customs. 2. ACCEPTING PERSONAL RESPONSIBILITY. Case Study for Critical Thinking: The Late Paper. Adopting the Creator Role. Victims and Creators. Responsibility and Choice. Journal Entry 4. ONE STUDENT'S STORY: Brian Moore (Glendale Community College, AZ). Mastering Creator Language. The Language of Responsibility. Journal Entry 5. ONE STUDENT'S STORY: Alexsandr Kanevskiy (Oakland University, MI). Making Wise Decisions. The Wise-Choice Process. Journal Entry 6. Personal Responsibility at Work. Believing in Yourself: Change Your Inner Conversation. The Curse of Stinkin' Thinkin'. Disputing Irrational Beliefs. Journal Entry 7. ONE STUDENT'S STORY: Dominic Grasseth (Lane Community College, OR). EMBRACING CHANGE: Do One Thing Different This Week. Wise Choices in College: Reading. 3. DISCOVERING SELF-MOTIVATION. Case Study for Critical Thinking: Popson's Dilemma. Creating Inner Motivation. A Formula for Motivation. Value of College Outcomes. Value of College Experiences. Journal Entry 8. ONE STUDENT'S STORY: Chee Meng Vang (Inver Hills Community College, MN). Designing a Compelling Life Plan. Roles and Goals. How to Set a Goal. Discover Your Dreams. Your Life Plan. Journal Entry 9. Committing to Your Goals and Dreams. Commitment Creates Method. Visualize Your Ideal Future. How to Visualize. Journal Entry 10. ONE STUDENT'S STORY: Amanda Schmeling (Buena Vista University, IA). Self-Motivation at Work. Believing in Yourself: Write A Personal Affirmation. Claiming Your Desired Personal Qualities. Living Your Affirmation. Journal Entry 11. ONE STUDENT'S STORY: Donna Ludwick (Carteret Community College, NC). EMBRACING CHANGE: Do One Thing Different This Week. Wise Choices in College: Taking Notes. 4. MASTERING SELF-MANAGEMENT. Case Study for Critical Thinking: The Procrastinators. Acting on Purpose. Harness the Power of Quadrant II. What to Do in Quadrant II. Journal Entry 12. ONE STUDENT'S STORY: Jason Pozsgay (Oakland University, MI). Creating an Effective Self-Management System. Monthly Calendars. Next Actions Lists. Tracking Forms. The Rewards of Effective Self-Management. Journal Entry 13. ONE STUDENT'S STORY: Allysa Lapage (Sacramento City College, CA). Developing Self-Discipline. Staying Focused. Being Persistent. Journal Entry 14. ONE STUDENT'S STORY: Holt Boggs (Belmont Technical College, OH). Self-Management at Work. Believing in Yourself: Develop Self-Confidence. Create a Success Identity. Celebrate Your Successes and Talents. Visualize Purposeful Actions. Journal Entry 15. EMBRACING CHANGE: Do One Thing Different This Week. Wise Choices in College: Studying for Deep Learning. 5. EMPLOYING INTERDEPENDENCE. Case Study for Critical Thinking: Professor Rogers' Trial. Developing Mutually Supportive Relationships. Ways to Relate A Sign of Maturity. Giving and Receiving. Journal Entry 16. ONE STUDENT'S STORY: Jason Matthew Loden (Avila University, MO). Creating a Support Network. Seek Help from Your Instructors. Get Help from College Resources. Create a Project Team. Start a Study Group. Journal Entry 17. ONE STUDENT'S STORY: Neal Benjamin (Barton County Community College, KS). Strengthening Relationships with Active Listening. How to Listen Actively. Use Active Listening in Your College Classes. Journal Entry 18. Interdependence at Work. Believing in Yourself: Be Assertive Leveling. Making Requests. Saying "No". Journal Entry 19. ONE STUDENT'S STORY: Amy Acton (Southern State Community College, OH). EMBRACING CHANGE: Do One Thing Different This Week. Wise Choices in College: Studying for Lasting Learning. 6. GAINING SELF-AWARENESS. Case Study for Critical Thinking: Strange Choices. Recognizing When You Are Off Course. The Mystery of Self-sabotage. Unconscious Forces. Journal Entry 20. ONE STUDENT'S STORY: Sarah Richmond (Missouri University of Science and Technology, MO). Identifying Your Scripts. Anatomy of a Script. How We Wrote Our Scripts. Self-Defeating Habits. Journal Entry 21. ONE STUDENT'S STORY: James Floriolli (Foothill College, CA). Rewriting Your Outdated Scripts. The Impact of Outdated Beliefs. Doing the Rewrite. Journal Entry 22. ONE STUDENT'S STORY: Annette Valle (The Victoria College, TX). Self-Awareness at Work. Believing in Yourself: Write Your Own Rules. Three Success Rules. Changing Your Habits. Journal Entry 23. EMBRACING CHANGE: Do One Thing Different This Week. ONE STUDENT'S STORY: Brandee Huigens (Northeast Iowa Community College, IA). Wise Choices in College: Writing. 7. ADOPTING LIFE-LONG LEARNING. Case Study for Critical Thinking: A Fish Story. Discovering Your Preferred Learning Style. Self-Assessment: How I Prefer to Learn. A. Thinking Learners. B. Doing Learners. C. Feeling Learners. D. Innovating Learners. Journal Entry 24. ONE STUDENT'S STORY: Melissa Thompson (Madison Area Technical College, WI). Employing Critical Thinking. Constructing Logical Arguments. Asking Probing Questions. Applying Critical Thinking. Journal Entry 25. Learning to Make Course Corrections. Change Requires Self-Awareness and Courage. Change and Lifelong Learning. Journal Entry 26. ONE STUDENT'S STORY: Jessie Maggard (Urbana University, OH). Lifelong Learning at Work. Believing in Yourself: Develop Self-Respect. Live with Integrity. Keep Commitments. Journal Entry 27. EMBRACING CHANGE: Do One Thing Different This Week. Wise Choices in College: Taking Tests. 8. DEVELOPING EMOTIONAL INTELLIGENCE. Case Study for Critical Thinking: After Math. Understanding Emotional Intelligence. Four Components of Emotional Intelligence. Knowing Your Own Emotions. Journal Entry 28. ONE STUDENT'S STORY: Lindsey Beck (Three Rivers Community College, CT). Reducing Stress. What Is Stress? What Happens When Stress Persists? Unhealthy Stress Reduction. Healthy Stress Reduction. Choose Your Attitude. Journal Entry 29. ONE STUDENT'S STORY: Jaime Sanmiguel (Miami Dade College, FL). Creating Flow. College and Flow. Work and Flow. Journal Entry 30. Emotional Intelligence at Work. Believing in Yourself: Develop Self-Love. Design a Self-care Plan. Journal Entry 31. EMBRACING CHANGE: Do One Thing Different This Week. Wise Choices in College: Money Management. 9. STAYING ON COURSE TO YOUR SUCCESS. Planning Your Next Steps. Assess Yourself, Again. Self-Assessment. Journal Entry 32.